Algerian physician and scholar; descended from a Granada family; died at Tlemçen in 1605. He established himself as a physician in 1574 at Algiers, where he acquired a large practise. 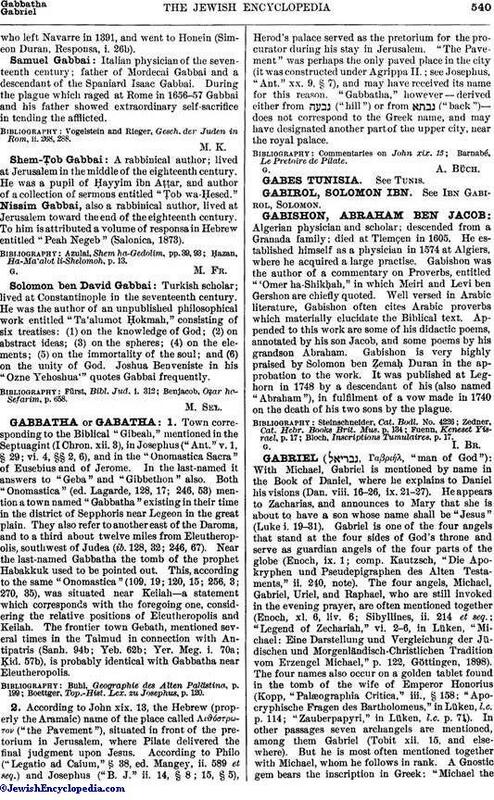 Gabishon was the author of a commentary on Proverbs, entitled "'Omer ha-Shikḥah," in which Meiri and Levi ben Gershon are chiefly quoted. Well versed in Arabic literature, Gabishon often cites Arabic proverbs which materially elucidate the Biblical text. Appended to this work are some of his didactic poems, annotated by his son Jacob, and some poems by his grandson Abraham. Gabishon is very highly praised by Solomon ben Ẓemaḥ Duran in the approbation to the work. It was published at Leghorn in 1748 by a descendant of his (also named "Abraham"), in fulfilment of a vow made in 1740 on the death of his two sons by the plague. Bloch, Inscriptions Tumulaires, p. 17.